In my opinion school improvement is a process that should involve all stakeholders, working together on a shared vision and be driven by diverse strands threading throughout the school, all feeding into this process. I would argue that although the overall direction of any school is ultimately driven by the headteacher, this needs to be shaped further by all staff through empowerment and I would suggest it’s how this saturates throughout the entire school, with ‘buy in’ from everybody that really matters. I’m sure you’ve seen it before, the best laid plans, an immaculate strategy, presented to the highest standard with honorable intentions, but ultimately loses focus and demonstrates very little impact, some of the obvious signs of ‘top down’ leadership. Keeping things simple and using the tried and tested PDSA model of change, provides a vehicle in which to reach and involve all members of staff. The first session is intended to allow everyone to familiarise themselves with the groups objective(s) and foci, promote team building and shape the direction of travel. Of the twenty or so members of staff within each group, sub teams of four or five are generated. During the next phase a proposal for professional development based around reading and action research will be put forward in a ‘speed date’ style by each sub team. Finally the whole group will co-opt for the proposal(s) they wish to work up collaboratively. This will then feed into the whole school training programme of professional development, with the ultimate goal of leading to whole school improvement. 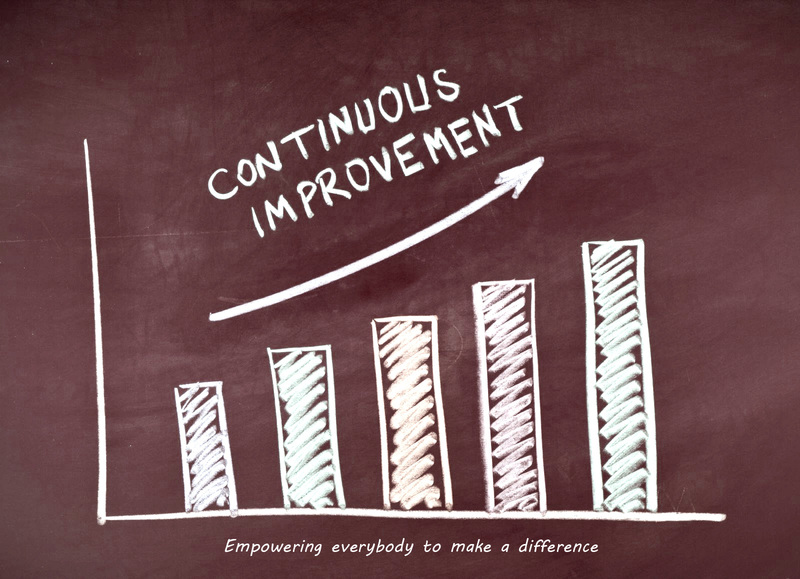 The time for the improvement teams is created through collapsing a training day and redeploying the six hours of that particular aspect of the time budget. This time is divided into six two hour slots and spread across the Autumn term, running from 3:30pm-5:30pm. By front loading the calendar this avoids key coursework deadlines/examination periods in the Spring Term and also allows time to embed the work undertaken before we evaluate late in the Summer term. I consider time to be the biggest barrier to professional development in education currently. If we want to create a culture of collaboration, risk-taking, innovation and aspiration, then we/me as a school leaders need to provide the environment and tools in which to do so, and time needs to be created. Empowering people is key, especially when building trust and promoting risk-taking, whilst at the same time instilling confidence. I strongly believe that these are all essential components in a culture where innovation is rich. 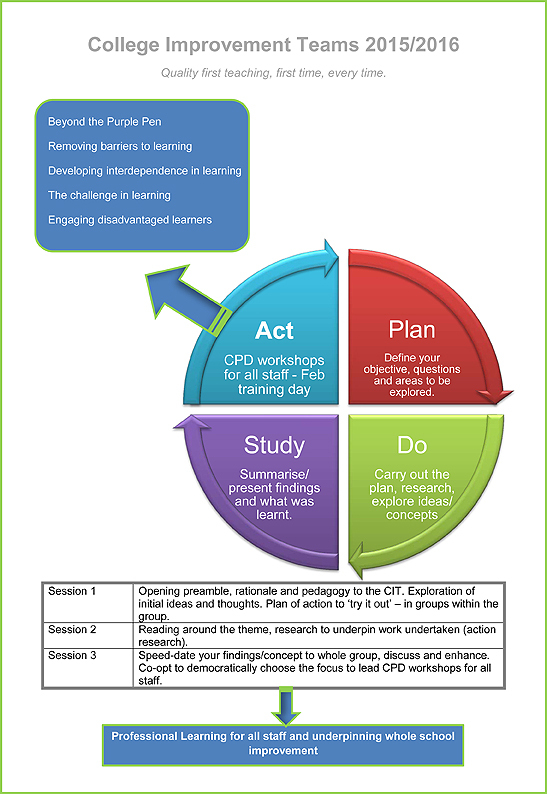 This CIT strategy offers teachers the chance to lead whole school change with measurable impact, whilst developing their own leadership skills. Forget the perceived hierarchy that exists in many schools, this is about teachers leading teachers, and yes, that does include some of our NQT’s and rightly so. 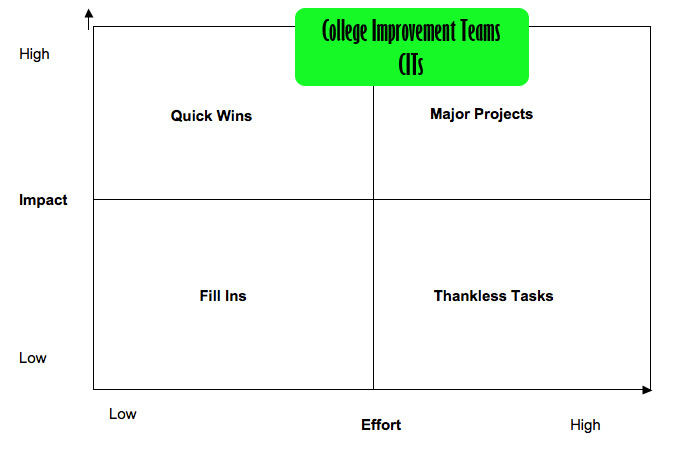 Along with colleagues, I have attempted to locate where we feel the improvement team model sits on the Impact vs Effort Matrix, as you can see, this overall strategy needs to be carefully planned as it will require a lot of effort from everyone involved, however, the impact has the potential to be high and profound. 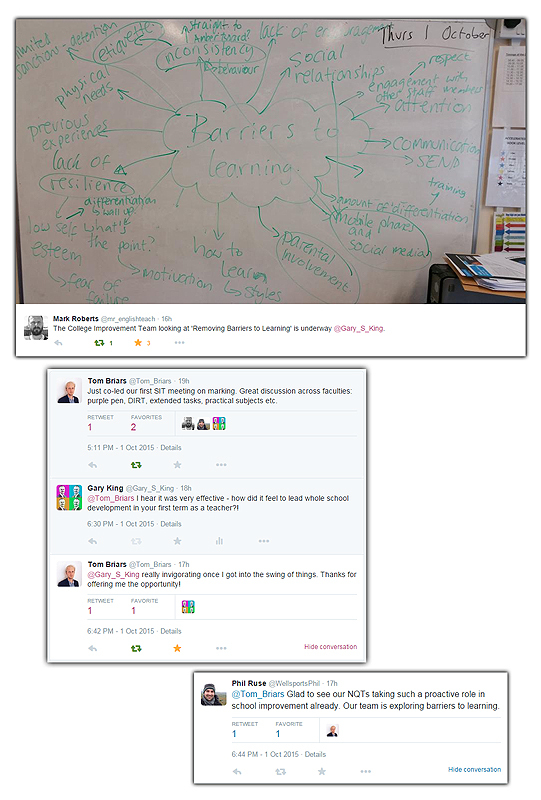 Opposite are a selection of tweets following the first sessions, not all of our staff are on twitter, but those who are, I would recommend following and contacting should you wish to learn more about their particular focus are: @mr_englishteach (Removing Barriers To Learning) @Tom_Briars (Beyond The Purple Pen) and @creatavi (Developing Interdependence In Learning). I’ll be blogging updates as work progresses along with research, examples, resources and quick wins that will hopefully help colleagues in other schools too.